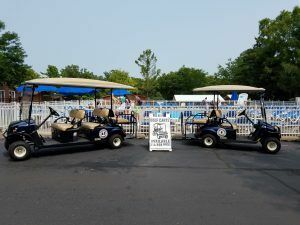 If you are fortunate enough to be staying at the Island Club for your Put-in-Bay Vacation, you also have access to the island’s best golf carts. Island Club Golf Carts are brand-new in 2018, gas-powered golf carts to get you everywhere you want to go on South Bass Island in style. As you would expect about a 3 square mile island, space is at a premium at Put-in-Bay. Parking especially has the potential to cause a lot of problems. 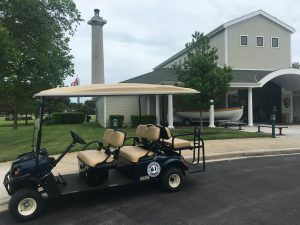 The rather unique solution that Put-in-Bay has come up with is to rely primarily on golf carts for transportation. While the space saving makes this very practical, it also adds an incredible charm for visitors. After all, how often do you get to drive a fun little open-air vehicle like this down the road? It is just one of the many things that makes a Put-in-Bay vacation special and memorable! The Island Club has brand new golf carts for you to use, and the reason they stay so clean and nice is that they’re only available to guests of the Island Club. Island Club Golf Carts give you the benefit of keeping your cart overnight, an amenity not available elsewhere on the island. They’ll collect the golf cart at the end of your stay! The Island Club is famous at Put-in-Bay, having been in the vacation rental business for decades. It’s a Put-in-Bay staple, and if you’ve stayed at the island before, chances are it was at the Island Club. If you haven’t experienced the Island Club yet, however, there’s no better time than the present. 8-, 10- and 12-person houses, as well as a couple specialty properties that can sleep up to 16, you can get your entire party under one roof. That makes for special vacation memories! If you’d like to learn more about it, check out our Island Club page, or just give us a call at 216-898-9951.